Dongchimi (aka winter kimchi) is a type of kimchi made with Korean radishes, garlic, ginger, Korean chili peppers, and sweet Asian pears. It’s cool, crisp, and refreshing to eat. Unlike the spicy red kimchi you see in grocery stores, this variation has a shorter fermentation period so you can enjoy it sooner. As the ingredients ferment in a process called lacto-fermentation, the liquid becomes tangy and fizzy. Not only will you have delicious kimchi to eat, you can drink this probiotic-rich brine alone or use in a cold noodle soup. As a time hack, citrus-flavored soda is a shortcut some cooks use to add more effervescence and sweetness to the recipe. As a play on the traditional recipe, I’ve added watermelon radish for a pop of color and a splash of Sprig’s CBD-Infused Sparkling Melon Soda right before serving. 1. Scrub Korean radishes clean in cold water. Cut radishes into 2” batons. 2. Toss the Korean radish batons in sea salt to coat evenly. Add all salted radishes into glass jar and close the lid. Keep in refrigerator for 3 days. 3. After 3 days, liquid will have formed in the jar. Do not drain. Add watermelon radish batons, garlic, ginger, chili peppers, scallions, and pear into the jar with the radishes along with 9 cups of water. Stir to combine all ingredients. Close the lid and let it ferment in room temperature for 2 days. 4. After 2 days, bubbles will begin to form and the brine will become tangy. Taste the brine and adjust the salt or water levels to taste then refrigerate. 5. You can consume the kimchi now but the longer it stays in the fridge the more the flavors will develop and deepen. 6. For one serving, fill an 8 oz side dish bowl with winter kimchi and brine. 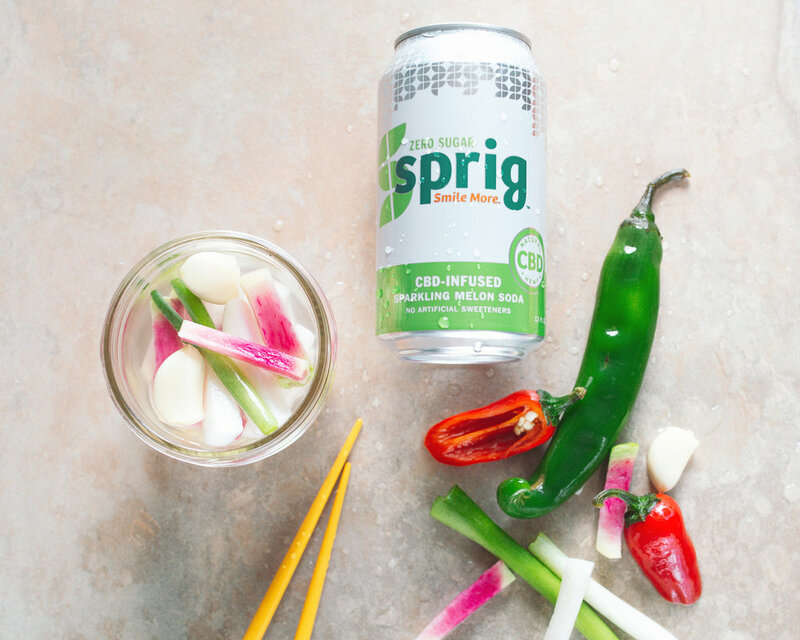 Add a tablespoon of Sprig’s CBD-Infused Sparkling Melon Soda or Sprig’s CBD-Infused Sparkling Citrus Soda for an extra effervescence. Enjoy with your meal.